"An engaging, thrilling adventure that pits powerful players against each other in realistic yet fantastic battles of mind, spirit and body - an imaginary yet believable world of angels, demons and humans that draws the reader irresistibly - an intriguing novel that will simmer in readers' minds long after the final page, fueling anticipation for the next installment in the series. Highly recommended!" The Columbia Review. Clash of Angels (Book One: The Unseen War) by Jeremiah Cross is an exciting novel that fuses spiritual fiction with supernatural warfare in refreshingly new ways. While the forces pitted against each others involve angels and demons, the excitement will satisfy believers, doubters and deniers of the divine, as a good story always does. The story is launched with the angel Dardanelle’s human charge being tempted by a demon to shoot his girlfriend over false accusations of cheating. Without giving away too much of the ensuing action, this event triggers a flareup that draws in also the fallen angel Arakiel, Satan’s minions, and various power players in hot pursuits on various levels of Hell, Heaven and, better yet, earth. The archangel Michael, naturally, plays a central role of virtue, as do Gabriel and other angels, all in the service of the highest order. Lucifer plays the greatest antagonist, as is his ultimate role, while flesh-and-blood humans are somewhat clueless as they serve key roles in the battle of spiritual titans over – what could be better? – the lives of innocent babies. “Excellent. I knew you would not fail me. Bring him closer. We have so much to talk about,” said Lucifer in a menacing tone. Beliar motioned and the fourth figure moved closer. Lucifer could see that the figure was wearing a dark crimson robe with a hood to hide the face. Thus, reaching all the way to Satanic sarcasm, the novel achieves a high level of realism in a realm far from it. 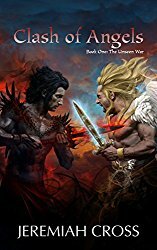 In summary, Clash of Angels (Book One: The Unseen War) offers an engaging, thrilling adventure that pits powerful players against each other in realistic yet fantastic battles of mind, spirit and body. The author presents an imaginary yet believable world of angels, demons and humans that draws the reader irresistibly. The underlying war between good and evil is presented with wonderful complexity, avoiding the cliche of black and white morality. This is a an intriguing novel that will simmer in readers’ minds long after the final page, fueling anticipation for the next installment in the series. Highly recommended!